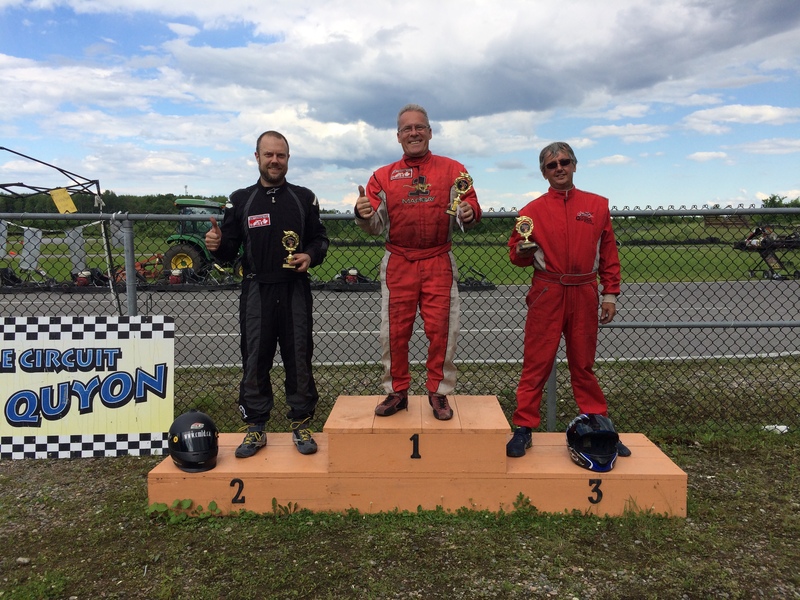 (Quyon, QC) The weather cooperated for most of the day on Saturday, August 12 making for a pretty good day for karting, with lightning and thunder showers holding off until mid-afternoon. It was the second last race of the 2017 edition of the OGKC. The Endurofest Series is a longer-distance race than usual for all classes, making for an exciting event that challenges a drivers stamina and fitness levels. Younger drivers in the Novice and Junior classes race for 20 minutes, while competitors in the Senior and Masters classes challenge for victory for a full 30 minutes. This race was also Race #8 of the Briggs & Stratton Weekly Racing Series Championship. The 2017 edition of the OGKC series is part of the B&S Weekly Racing Series, a track-based series enabling Junior, Senior, and Masters competitors to race head-to-head for the B&S Weekly Racing Series regional crown. Racers are required to participate in eight (8) races at the same B&S Weekly Racing Series-affiliated track/club, with the top seven (7) results counted toward the overall championship. For more information on the BriggsWRS, please click here. Samuel had another great race, sharing the track for the second time with Senior and Masters competitors. He had a great race, and again proved to be right at home on the track at Le Circuit Quyon. Samuel’s best time was just a few seconds off the pace of the top Senior drivers – another great drive by this talented young racer! Paul Hoffman led start to finish, having a really great race until thunder and lightning mixed with rain showers brought out the red flag. Tyler Devlin kept Paul honest, always in very close proximity and ready to pounce if the leader made a mistake. 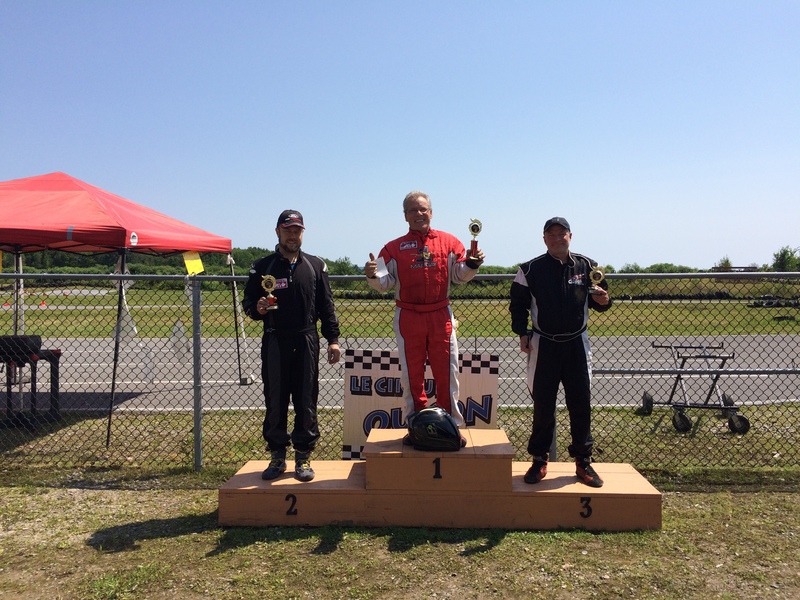 Rounding out the top three was Vincent Lamothe, who drove an excellent race to finish in third position. Mike Forget and Darren Mallette fought hard for the top step of the podium, with Mike taking advantage of a great first lap to eek out a gap and maintain it for the duration of the race. Mike crossed the line over two seconds ahead of Darren, with Crawford Kilpatrick fighting hard to take third position trailing seven seconds behind. Michele-Ann and Guy fought tooth and nail for the full distance of the Rental Kart Challenge Enduro, with Michele-Ann taking top honours at the end of the 30-lap event by just over one second. Winfried, participating in his first kart race, did extremely well and managed to get to within a few seconds of the leader’s pace. We hope to see you out in the future Winfried! Congratulations to all of the racers that made the podium, and a big thank you to everyone that participated in the Endurofest event. Great job everyone! The points for the overall series can be viewed here. Special thanks to track-owner Paul Lalonde for taking on the role of Race Director for Race #2. Also, special thanks to the track marshals, the great support staff at Le Circuit Quyon, and First Aid guru Pat Warner for ensuring racer safety during the event. Please join us on Sunday, September 10 for the final race of the OGKC’s Endurofest Series, as well as the last OGKC race of the year. Additional information on race format, rules and regulations, as well as track layout will be communicated in the near future. It will also be the final race of the OGKC Rental Kart Challenge. Please click here for more information on the rental series. 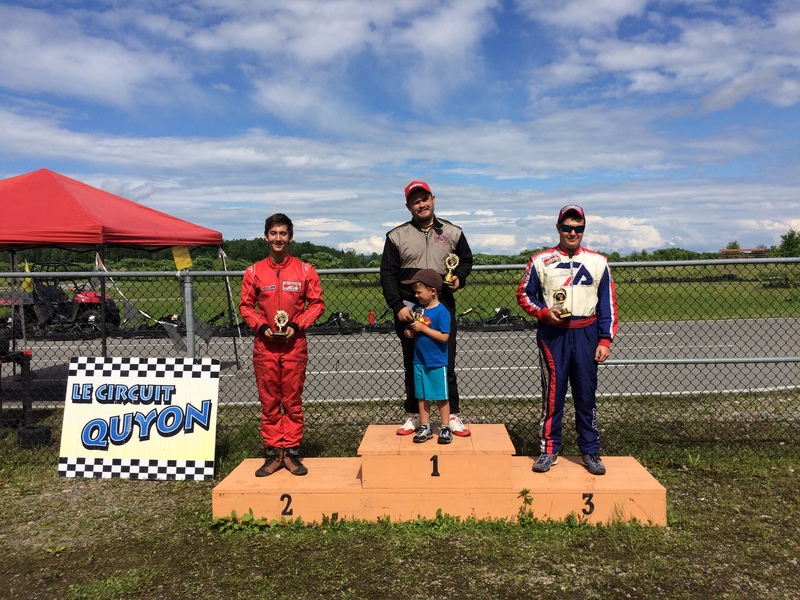 (Quyon, QC) It was a fantastic day for a kart race, with temperatures hovering in the mid to high 20s under bright blue skies; however, the turnout for Race #1 of the OGKC Endurofest Series was a little lower than expected due to the summer holiday season. 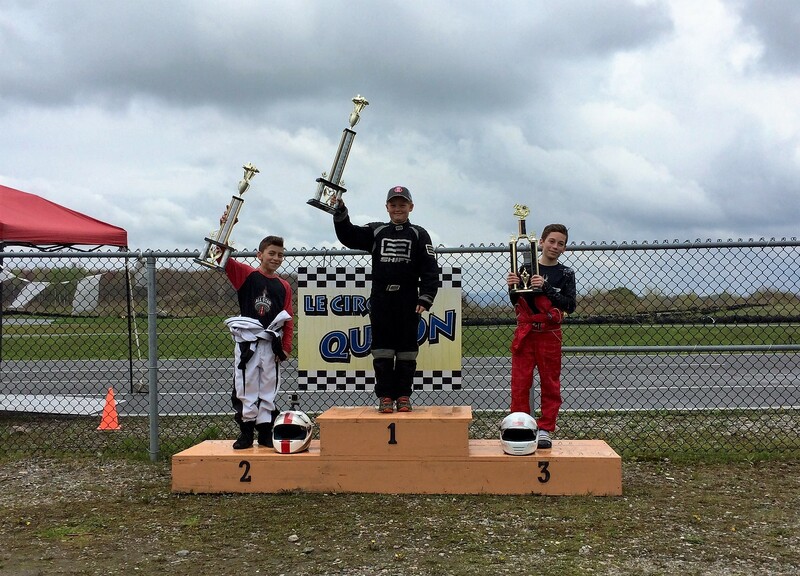 It was the start of the final three-race series of the year for the OGKC! The Endurofest Series is a longer-distance race than usual for all classes, making for an exciting event that challenges a drivers stamina and fitness levels. Younger drivers in the Novice and Junior classes race for 20 minutes, while competitors in the Senior and Masters classes challenge for victory for a full 30 minutes. This race was also Race #7 of the Briggs & Stratton Weekly Racing Series Championship. Samuel had an interesting race, sharing the track for the first time with Senior and Masters competitors. He had a great race, and proved to be very fast around Le Circuit Quyon! Samuel’s best time was less than four seconds off the pace of the top Senior drivers – great driving! Michel Filion, a Margay ‘arrive and drive’ racer at this event, qualified a fantastic second place in the Senior category, bested only by resident hot-shoe Charlotte Lalonde; however, Michel successfully finished the half-hour Final in first place over a hard-charging Lee Williscroft in his TonyKart. Rounding out the top three was Vincent Lamothe. Mike Forget and Darren Mallette fought hard for the top step of the podium, with Darren leading for much of the race only to have Mike steal the lead as the end was drawing near. After 30 minutes of racing, Mike crossed the line a full 0.2 ahead of Darren, with Eric Lefebvre taking third position trailing over 15 seconds behind the front two. Special thanks to Race Director Jamie Bolton, the track marshals, the great support staff at Le Circuit Quyon, and First Aid guru Pat Warner for working throughout the day to ensure racer safety during the event. Please join us on Saturday, August 12 for Race #2 of the OGKC’s Endurofest Series. Additional information on race format, rules and regulations, as well as track layout will be communicated in the near future! It will also be Race #3 of the OGKC Rental Kart Challenge, weather permitting. Please click here for more information on the rental series. 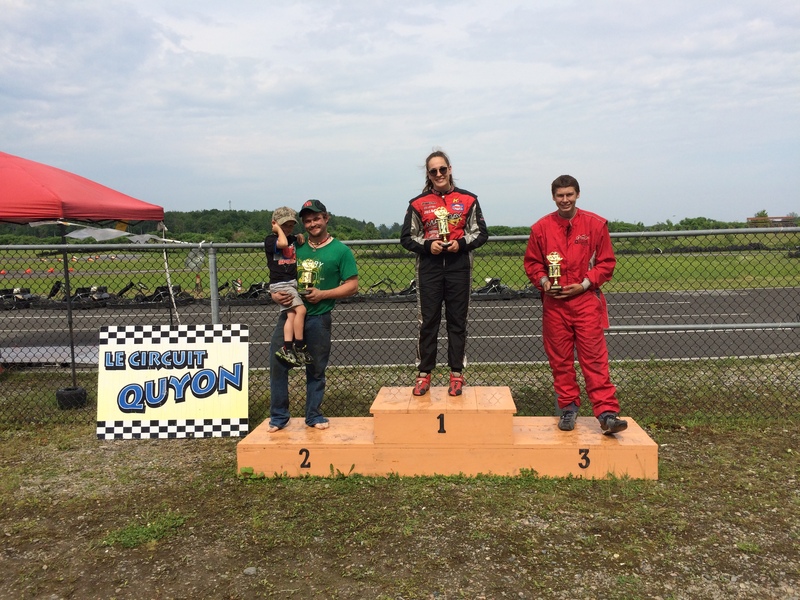 (Quyon, QC) Saturday, July 8 turned out to be a great day for a kart race at Le Circuit Quyon. It was the grand finale of the OGKC Summer Superpole Series. The three-race series was held exclusively on Saturdays – June 17, June 24, and July 8. The third and final Superpole Series race was also Race #6 of the OGKC championship for those battling for the overall season Crown, as well as Race #6 of the Briggs & Stratton (B&S) Weekly Racing Series Championship. The weather was great, with temperatures hovering in the mid 20C range for the entire day. The track had some water pooling on the inside line heading into the infamous high-speed bowl section, making for some daring pass attempts and interesting racing! Superpole is a timed event commonly used in superbike racing to establish the starting grid for the top qualifiers in each category. In the OGKC Superpole Series, the superpole session enables the top three qualifiers to complete one flying solo lap to set their best times – potentially re-gridding the top three for the race sessions. The 2017 edition of the OGKC series is also part of the B&S Weekly Racing Series, a track-based series enabling Junior, Senior, and Masters competitors to race head-to-head for the B&S Weekly Racing Series regional crown. Racers are required to participate in eight (8) races at the same B&S Weekly Racing Series-affiliated track/club, with the top seven (7) results counted toward the overall championship. For more information on the BriggsWRS, please click here. Shane Findlay of the Lombardy Karting Association (LKA) was on fire all day, placing first in superpole qualifying, the pre-final, as well as the final. Shane’s excellent results in Race #3 contributed to him being crowned the overall Senior superpole champion. Congratulations Shane! Tyler Devlin, who was participating in his first race this year, had a great day as well with a third in qualifying, and second place in both the pre-final and final. Rounding out the top three was Paul Hoffman, racing in his first year in the Senior category. Congratulations to all the racers that competed in the Senior category! Mike Forget made it two wins in a row claiming victory in the final race of the Masters Superpole Series, beating out the very fast Brian McCracken. Brian had held onto first place in the race for several tours of the circuit; however, he was ultimately overtaken by Mike with only a handful of laps remaining. Coming home in third position was Sylvain Coulombe, who narrowly missed out on second by 0.004 seconds. The racing was extremely tight, with the top six separated by less than two seconds at the conclusion of the 15-lap final. There were several changes of position throughout the race, making for a really entertaining event. Last but not least, the Juniors competed on track at the same time as the Senior category, mixing it up with the older racers and really representing well! Both Denver and Nathan had strong races, and ended up with best laps a mere two seconds off the pace of top Senior racer Shane Findlay. Great job by the Juniors, and we hope to have a better turnout in this category for our Enduro Series! Congratulations to all of the racers that made the podium, and a big thank you to everyone that participated in the 2017 OGKC Summer Superpole Series. Judging by the results and the interest in the superpole concept, the series will definitely be returning next year. Great job everyone! The points for the series can be viewed here. Special thanks to Race Director Jason Bolton, the track marshals, the great support staff at Le Circuit Quyon, and First Aid personnel for working throughout the day to ensure racer safety during the event. Please join us on Sunday, July 30 for Race #1 of the OGKC’s Enduro-Fest Series. Additional information on race format, rules and regulations, as well as track layout will be communicated in the near future! It will also be Race #3 of the OGKC Rental Kart Challenge, weather permitting. Please click here for more information on the rental series. Enjoy the three-week summer break, and we look forward to seeing you back at the track at the end of the month! 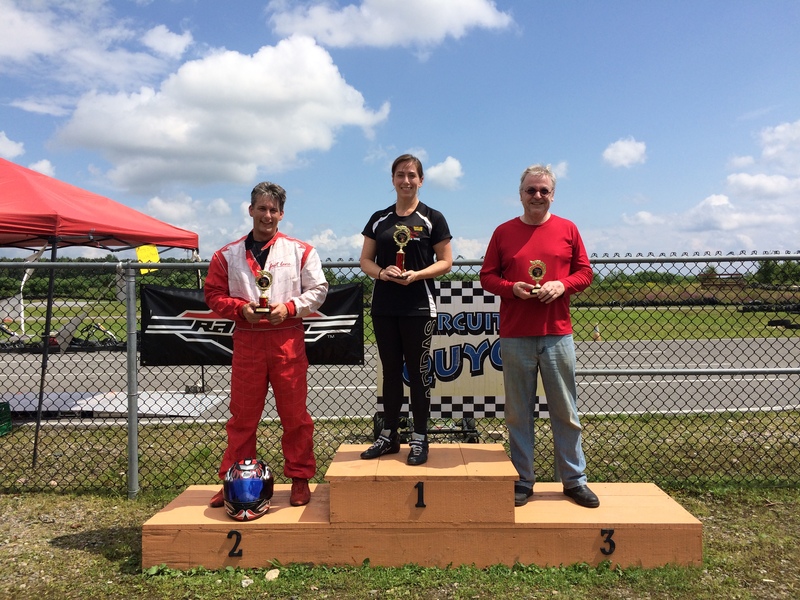 (Quyon, QC) What a perfect day for Race #2 of the Ottawa-Gatineau Karting Championship’s (OGKC) Summer Superpole Series. The three-race series is being held exclusively on Saturdays – June 17, June 24, and July 8. 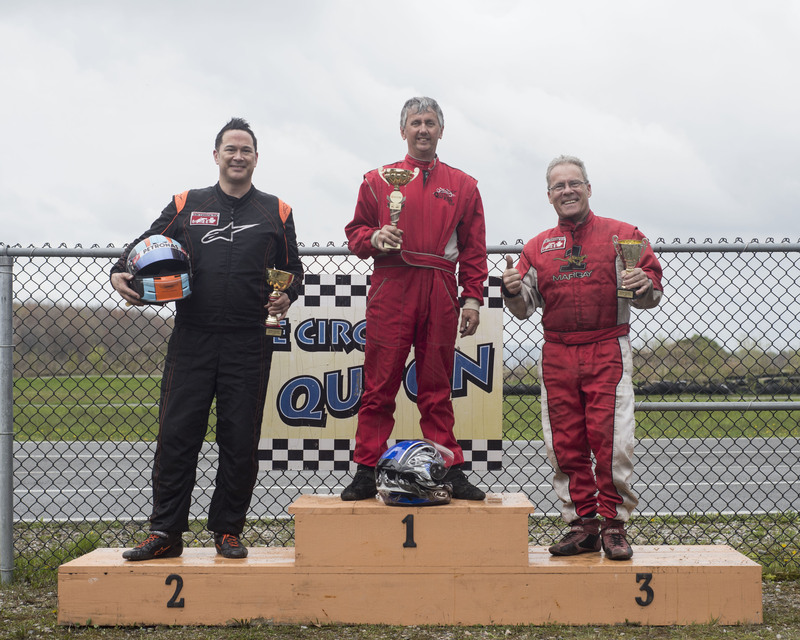 The second Superpole Series race was also Race #5 of the OGKC championship for those battling for the overall season Crown, as well as Race #5 of the Briggs & Stratton (B&S) Weekly Racing Series Championship. The weather was great, with temperatures hovering in the mid-to-high 20C range for the entire day. Charlotte Lalonde has proven unbeatable so far this season, winning Race #2 of the Superpole Series. Charlotte has won five out of five OGKC races this year, but her days at the front of the field could be numbered. Jamie Hynes, who finished second, has been coming on very strong this year and had a fastest lap within six-hundredths of a second of Charlotte’s best lap of the race. It won’t be long before Charlotte and Jamie will be duking it out for the top step of the podium. Shane Findlay, a regular racer with the Lombardy Karting Association, had an excellent race as well finishing only six-tenths of a second behind Jamie over the 15-lap race. Shane was holding onto second position for most of the race, but Jamie forced her way past with only two laps to go to steal second place position. Shane was also lapping extremely well, and proved very difficult to pass over the duration of the race. These three will be challenging each other for the overall Superpole championship – only 19 points separate these three challengers, with 105 points still up for grabs in the final race. Race #3 of the Senior Superpole Series will be a real humdinger of an event! The OGKC had nine participants in the Senior event – how many will compete in the Superpole final? After a two-race absence from the top step of the box, Mike Forget made a glorious return to form by winning Race #2 of the Masters Superpole Series, beating out the very fast Darren Mallette. Darren was racing in an unfamiliar kart during the event due to mechanical issues with his regular steed. True to form, Darren was able to adjust to the new kart and was lapping within a few tenths of a second of Mike’s best lap time. Coming home in third position was Brian McCracken, who benefited from two disqualifications due to fuel irregularities. 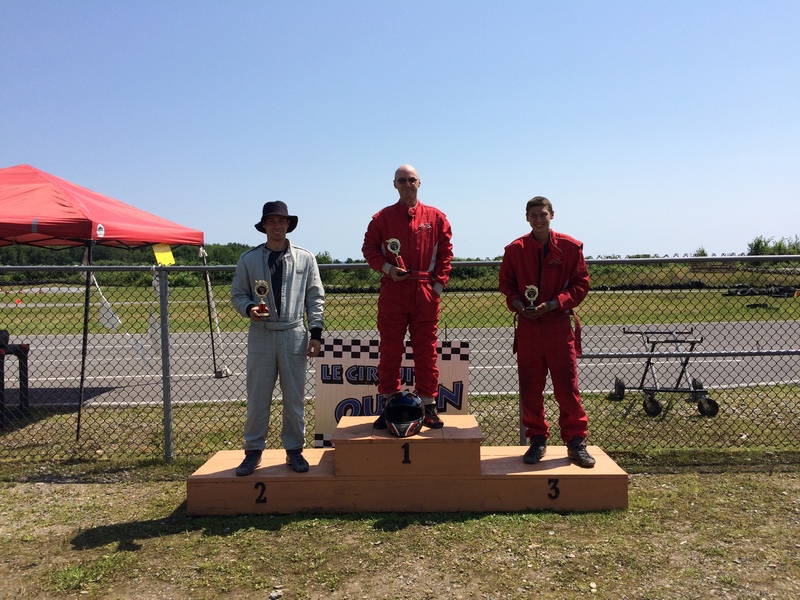 Honourable mentions go to Wayne Shimoon and Sylvain Coulombe, who both participated in their first OGKC event of the year, and proved to be extremely fast. They will definitely be contenders for victory in Race #3 of the Series, which is scheduled for Saturday, July 8. Eight Masters racers participated in this event – we hope that we get a strong field at the Superpole final! Congratulations to all of the racers that made the podium, and a big thank you to everyone that participated in Race #2 of the 2017 OGKC Summer Superpole Series. Great job everyone! The points for the series can be viewed here. Special thanks to special guest Race Director Jamie Bolton, the track marshals, the great support staff at Le Circuit Quyon, and First Aid personnel for working through the day to ensure racer safety during the event. Race #3 of the OGKC’s Summer Superpole Saturday Series is scheduled for Saturday, July 8. It will also be Race #3 of the OGKC Rental Kart Challenge, weather permitting. Please click here for more information on the rental series. See you at the track – have a great Canada Day weekend! 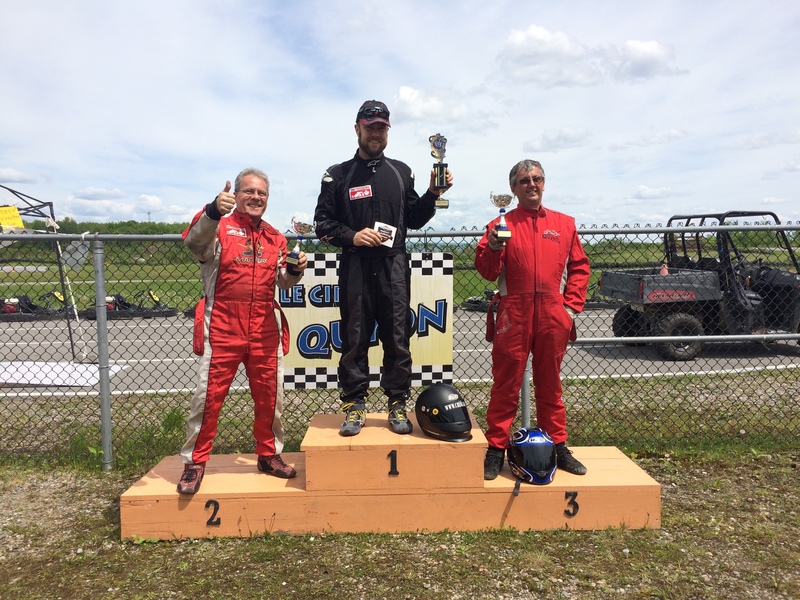 (Quyon, QC) What a start to the Ottawa-Gatineau Karting Championship’s (OGKC) Summer Superpole Series! The three-race series is being held exclusively on Saturdays – June 17, June 24, and July 8. The first Superpole Series race was also Race #4 of the OGKC championship for those battling for the overall season Crown. The weather was great, with temperatures hovering around 27C with the rain holding off for the majority of the race day; however, some sporadic showers made for some seriously challenging and entertaining races. Over 20 racers participated in the event in five different categories: Novice, Junior, Senior, and Masters Briggs & Stratton (B&S), as well as the rental series. The 2017 edition of the OGKC series is also part of the B&S Weekly Racing Series (BriggsWRS), a track-based series enabling Junior, Senior, and Masters competitors to race head-to-head for the BriggsWRS regional crown. Racers are required to participate in eight (8) races at the same BriggsWRS-affiliated track/club, with the top seven (7) results counted toward the overall championship. For more information on the BriggsWRS, please click here. The feature race podium results were as follows. It was great to see these three awesome Novice racers fighting for the win. Connor put on a clinic, and was able to stretch out a sizable lead over his two competitors. Connor performed extremely well, and was able to pass several Junior competitors who were racing at the same time in a staggered-race format. 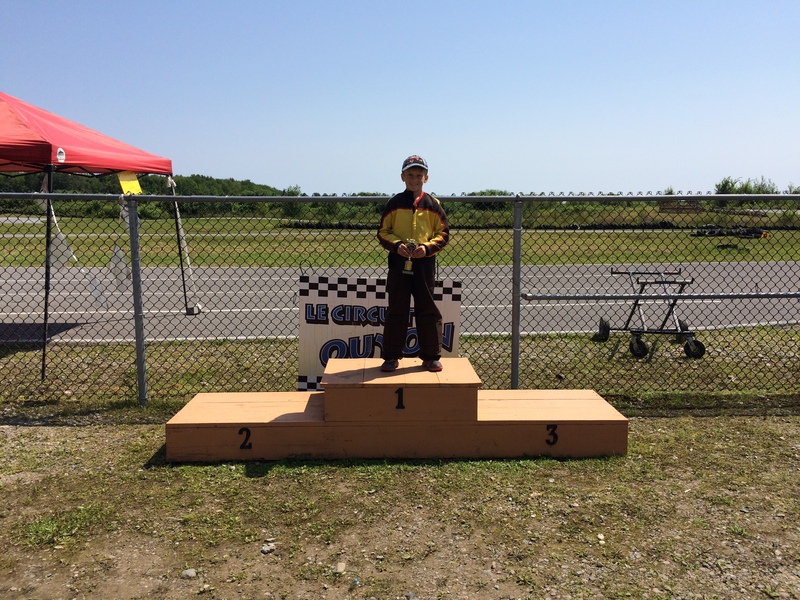 Linkin Stevens, from the Lombardy Karting Association, did an equally great job to finish in second. 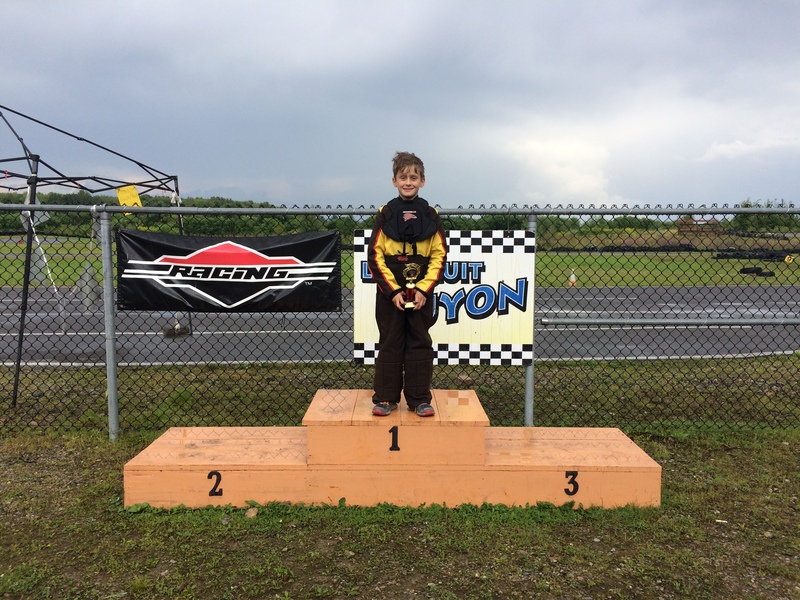 Brayden, in his first run this year in his new Margay Racing kart, placed third. Great job by all three racers and we’re looking forward to seeing you at the next Superpole Series race! 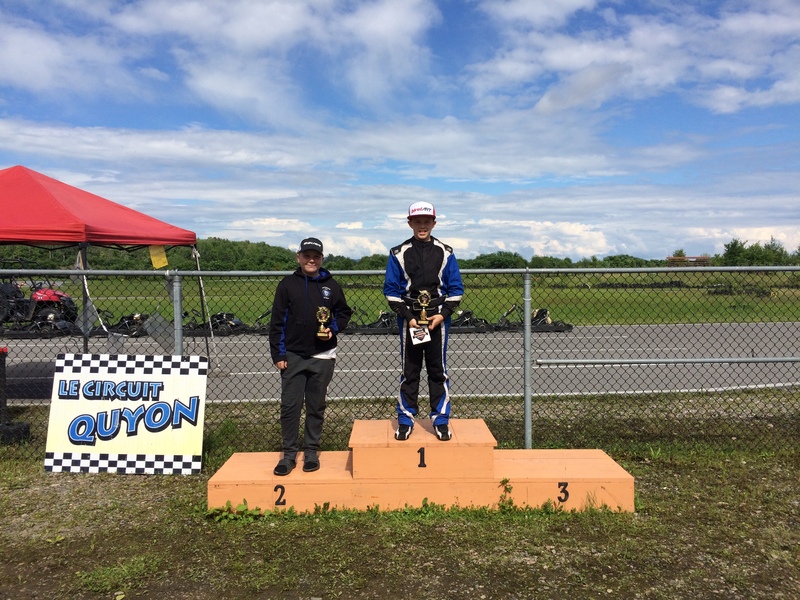 Zachary Vanier, reigning Canadian Junior B&S Champion and regular racer at Sudbury Kartways, made a special guest appearance at Le Circuit Quyon and raced an incredible final. After qualifying almost two seconds ahead of his nearest rival, Zachary raced brilliantly to win on his first visit to the track. Ethan Bell placed a strong second, while Zander Stevens, winner of the 2017 OGKC Spring Spring Series, came home in third position. It was an awesome race to watch, and we look forward to seeing more Juniors at the next round. Multi-year OGKC Senior Champion Charlotte Lalonde demonstrated her amazing racing skills once again by winning Race #1 of the Superpole Series. 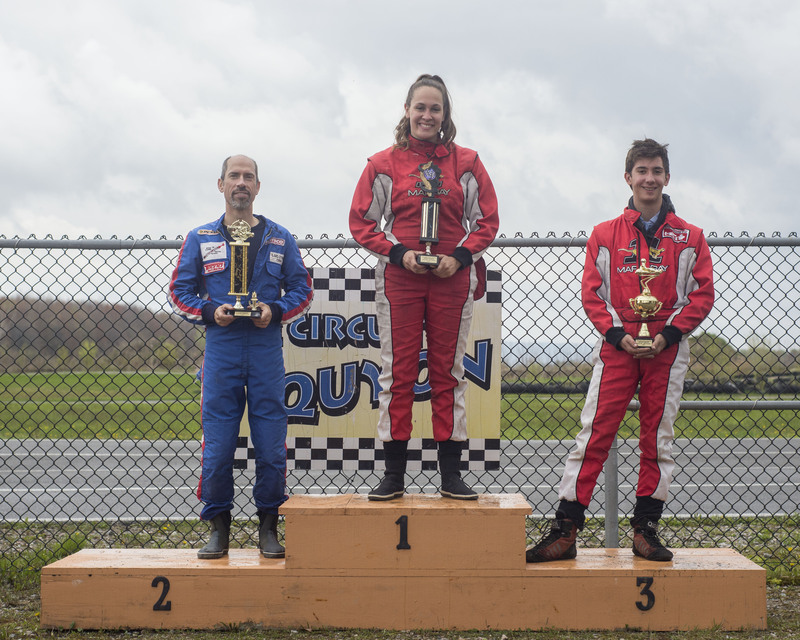 Charlotte claimed first place in qualifying by over four tenths of a second, and extended that gap to six tenths of a second in the first OGKC superpole format. Second place in the Final went to Shane Findlay of the Lombardy Karting Association. Shane had a fierce battle with Vincent Lamothe, with the two racers trading paint on a number of occasions over the last several laps. At the end of the race, Shane was able to maintain his second place by just over a kart length from Vincent. This was a very competitive field and saw a lot of close racing throughout the day. Honourable mention to Jamie Hynes, who had an excellent qualifying session as well as a great overall race day. She’s getting faster and faster, and will become a regular podium finisher in the near future. Darren Mallette celebrated his second win in an OGKC Final event, and proved to be unpassable today out on the track. Darren had another great weekend at Le Circuit Quyon. The first qualifying session saw Mike Forget in first, Darren in second, with James Dunn rounding out the top three; however, the superpole session resulted in a complete re-gridding of the top three, with Darren taking the top qualifying position, James Dunn taking second, with Mike ending up back in third. The race was fantastic, and included both dry and wet conditions. Darren was able to maintain his lead in some seriously challenging conditions, and kept James Dunn and reigning OGKC Masters Champion Mike Forget behind him to take the overall victory. Darren has come a long way this year, and has now taken two races in a row – great job. 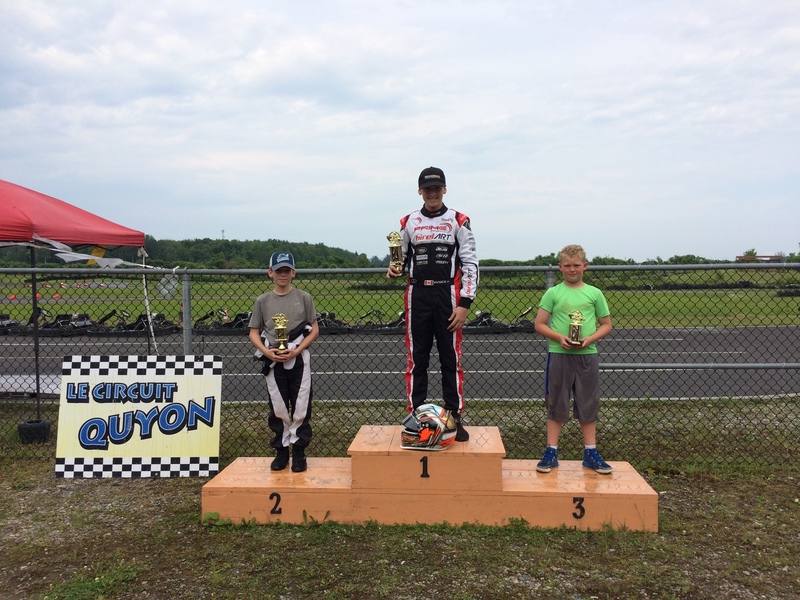 Guy Bélisle, who placed third in last year’s OGKC Rental Kart Series, had a great race taking his first victory since September 2016. He was able to stretch out a significant lead over the following pack, with Michèle-Ann Sauvé following up in second place. 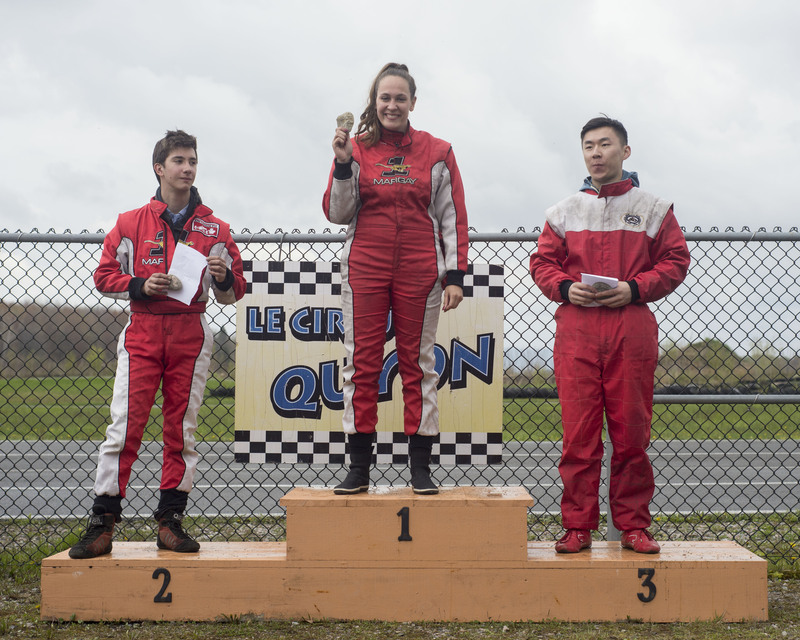 Zachary Vanier used the rental kart race to learn the track and get used to the variety of corners and straights offered by Le Circuit Quyon, in preparation for the Junior series races. Congratulations to all of the racers that made the podium, and a big thank you to everyone that participated in Race #1 of the 2017 OGKC Summer Superpole Series, as well as the participants in the Rental Kart Challenge. Great job everyone! The points for the series can be viewed here. Race #2 of the OGKC’s Summer Superpole Saturday Series is scheduled for Saturday, June 24. It will also be Race #3 of the OGKC Rental Kart Challenge, weather permitting. Please click here for more information on the rental series. 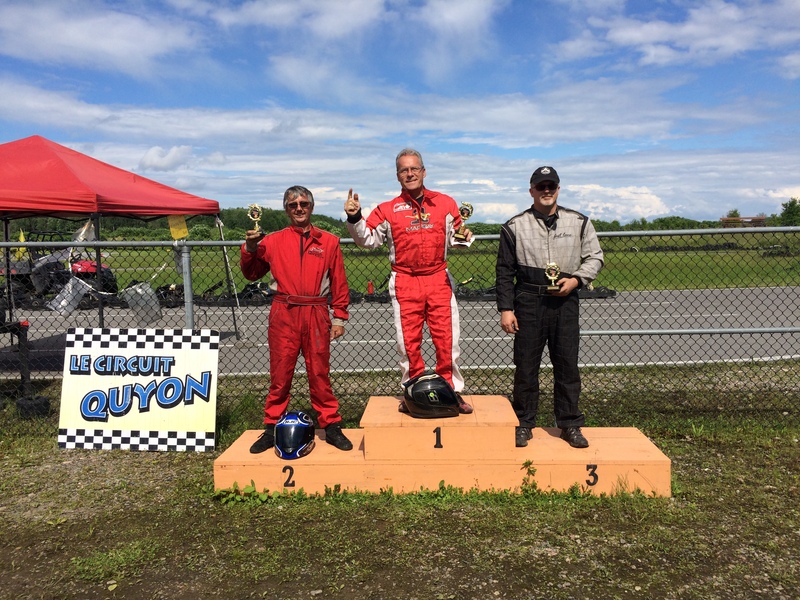 (Quyon, QC) What a great day for racing! Hot and sunny in Monaco, Indianapolis, and Quyon – the three cities that host the events that make up the (unofficial) triple crown of motorsports! 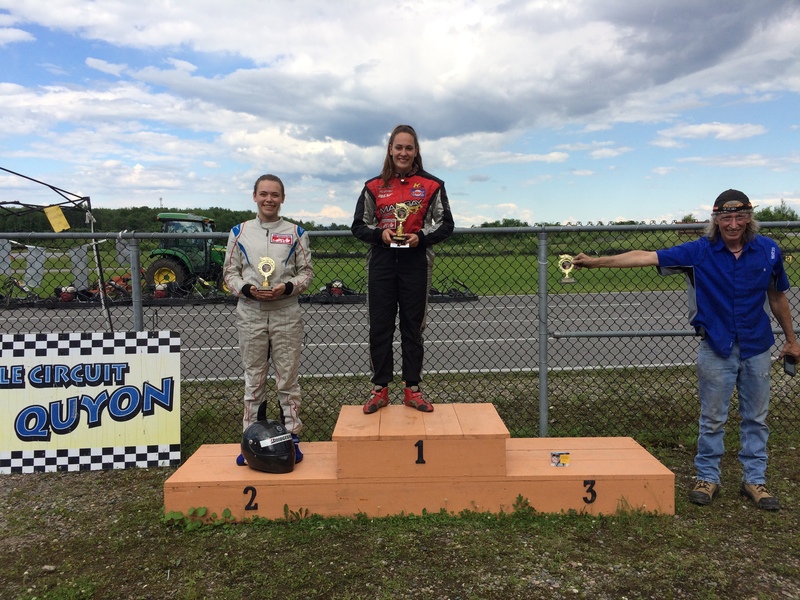 Twenty racers participated in Race #3 of the OGKC Spring Sprint Series and Race #1 of the Rental Kart Challenge. Races were held in three different categories: Senior Briggs & Stratton, Masters Briggs & Stratton, and the rental series. For a class race to be official, there must be a minimum of three participants. The 2017 edition of the OGKC series is also part of the Briggs & Stratton Weekly Racing Series (BriggsWRS), a track-based series enabling Junior, Senior, and Masters competitors to race head-to-head for the BriggsWRS regional crown. Racers are required to participate in eight (8) races at the same BriggsWRS-affiliated track/club, with the top seven (7) results counted toward the overall championship. For more information on the BriggsWRS, please click here. This race did not disappoint! It was very exciting to see resident hot-shoe Charlotte Lalonde being chased down by both Paul Hoffman and Jamie Hynes in their Margay chassis. Charlotte led the race from the green flag to the chequered; however, both Paul and Jamie were incredibly fast and will definitely be threatening Charlotte for the top step of the podium over the 2017 season. This was the first race that both Paul and Jamie demonstrated really amazing speed, and clearly served notice to Charlotte that her reign as the queen of the track may be coming to an end – awesome racing by the top three! 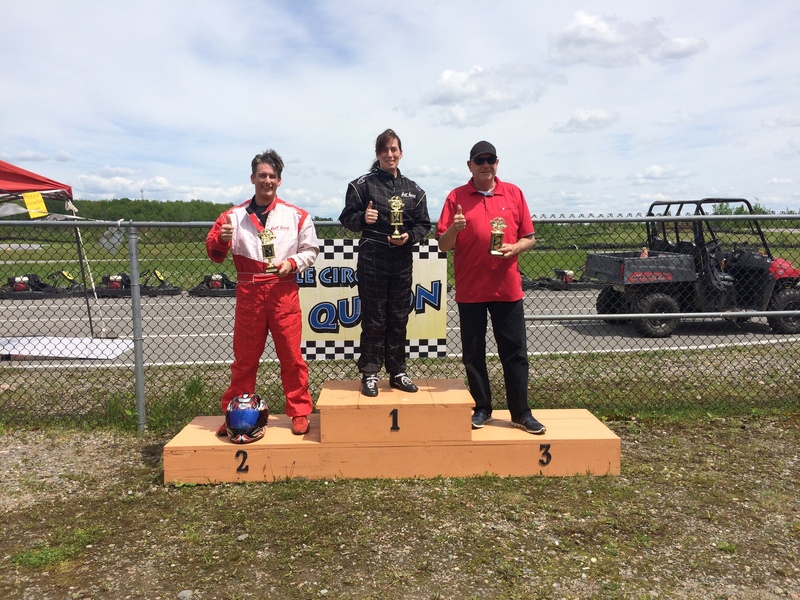 Darren Mallette celebrated his first win in an OGKC Final event, and proved to be unpassable today out on the track. Darren’s weekend didn’t start off that well, with his kart suffering from mechanical gremlins and brake issues; however, when it counted, Darren rose to the challenge and fended off several pass attempts by reigning OGKC Masters Champion Mike Forget and resident Barrovian Brian McCracken to win the race by four-tenths of a second. Brian has also shown incredible speed as of late, qualifying in second position for the race and also celebrating his second podium of the year. Great job Masters! 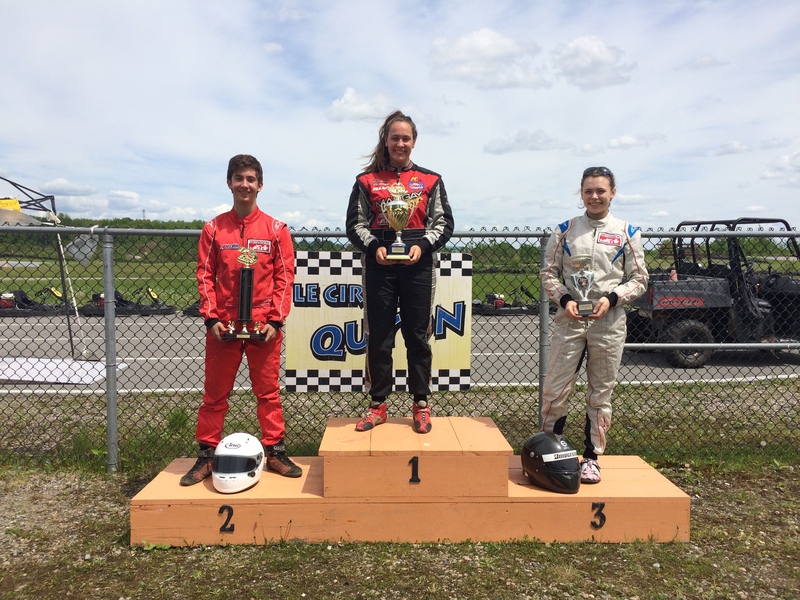 Michèle-Ann Sauvé, who placed second in last year’s OGKC Rental Kart Series, started off her 2017 campaign with a bang by winning the first rental race of the year. She was able to stretch out a significant lead over the following pack, with Guy Bélisle and Peter Dunn trading positions several times over the entire 15-minute duration of the race. Guy was able to eek over the finish line in second position, only one kart-length ahead of Peter. Honourable mention goes to Rick Hynes, who proved very challenging to pass and finished the race in fourth. Special thanks to special guest Race Director James Dunn, the track marshals, the great support staff at Le Circuit Quyon, and First Aid personnel for working through the day to ensure racer safety during the event. Race #1 of the OGKC’s Summer Superpole Saturday Series is scheduled for Saturday, June 17. It will also be Race #2 of the OGKC Rental Kart Challenge, weather permitting. Please click here for more information on the rental series. (Quyon, QC) What a time we’ve been having lately in Canada’s Capital Area – several communities in both Ottawa and Gatineau have been hit hard by record amounts of rainfall during late April and early May. This affected the first race of the year (originally scheduled for Sunday, May 7), with the event being postponed until Saturday, May 13. Races #1 and #2 of the OGKC’s Spring Sprint Series were run together as a doubleheader – that’s a lot of racing for one day! As luck would have it, and as predicted by the weatherman, we had another rainy day on Saturday; however, it was actually a moderately warm day with very light rain for the majority of the time. Participants were racing on a damp to wet track with little in the way of rainfall – for you F1 fans out there, it would have been a great day for ‘intermediates’. 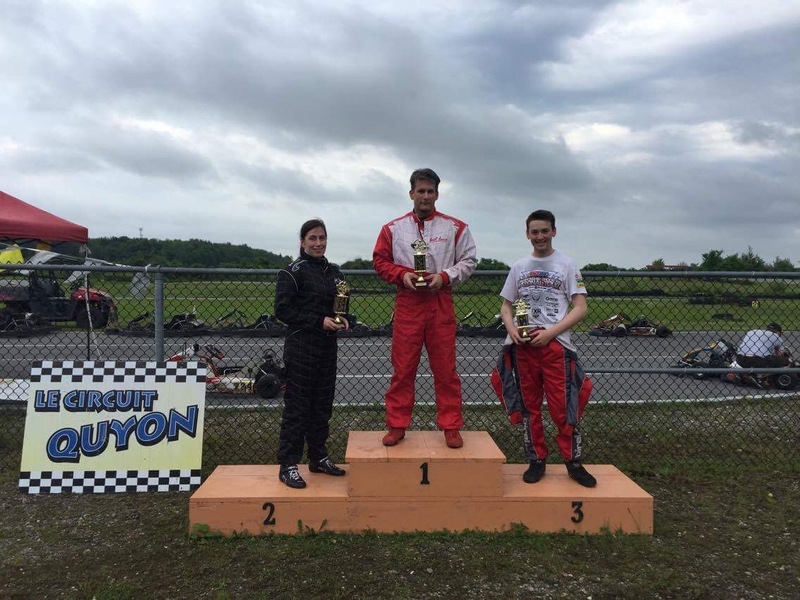 Fifteen racers registered for Races #1 and #2, persevering through the inclement conditions to challenge for the top step of the podium in three different classes: Junior Briggs & Stratton, Senior Briggs & Stratton, and Masters Briggs & Stratton. For a class race to be official, there must be a minimum of three participants. 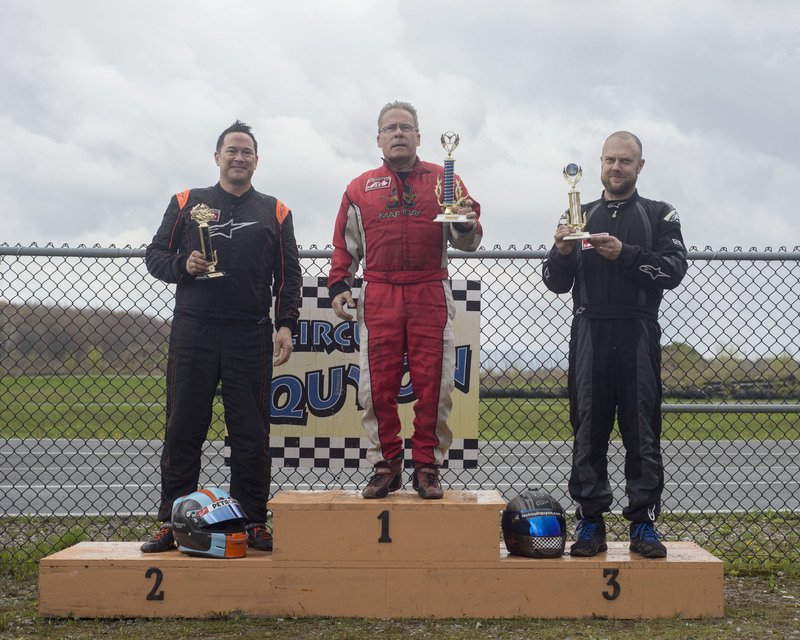 The OGKC Rental-kart Challenge was not held due to the wet track conditions. The 2017 edition of the OGKC series is also part of the Briggs & Stratton Weekly Racing Series (BriggsWRS), a track-based series enabling Junior, Senior, and Masters competitors to race head-to-head for the BriggsWRS regional crown. Racers are required to participate in eight (8) races at the same BriggsWRS-affiliated track/club, with the top seven (7) results counted toward the overall championship. For more information on the BriggsWRS, please visit the BriggsWRS site. This race did not disappoint! 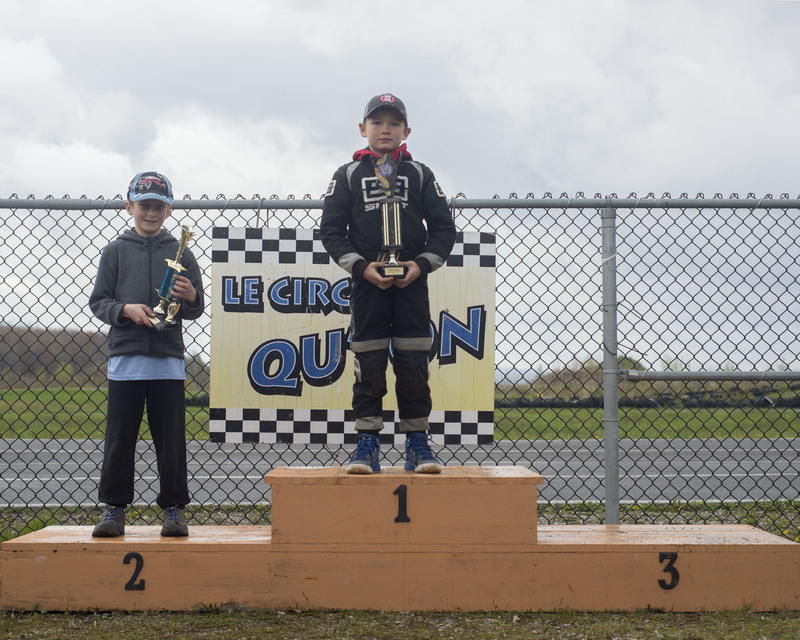 Zander Stevens, racing at Le Circuit Quyon for his first time, did an excellent job in the tricky conditions to capture first place in both Race #1 and #2 of the Junior category. By the end of the second race, his hands were pretty sore from the challenging “Intermediate Circuit”, which includes some tricky mid-to-high-speed corners as well as a variety of track elevation changes. 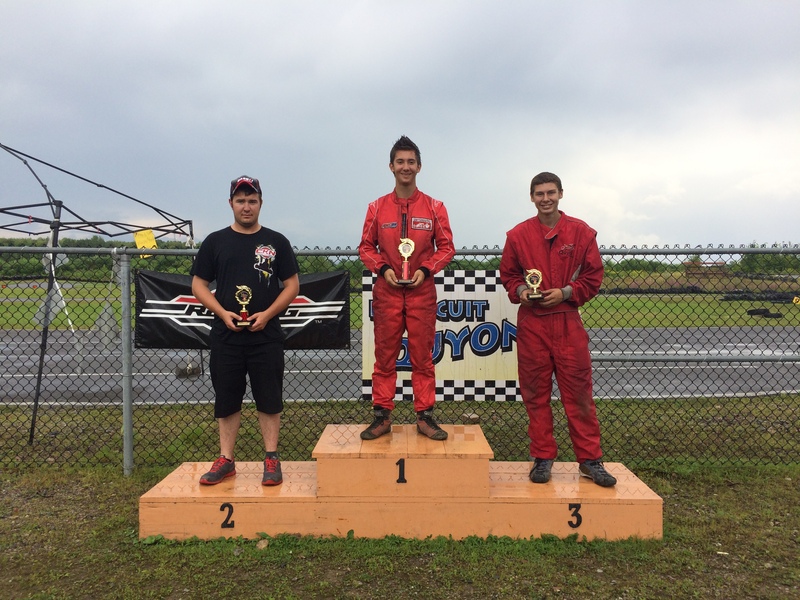 Connor Bell, who placed second in the 2015 overall OGKC Novice Championship, showed his continuing mastery behind the wheel by finishing in second place in both Final #1 and #2. 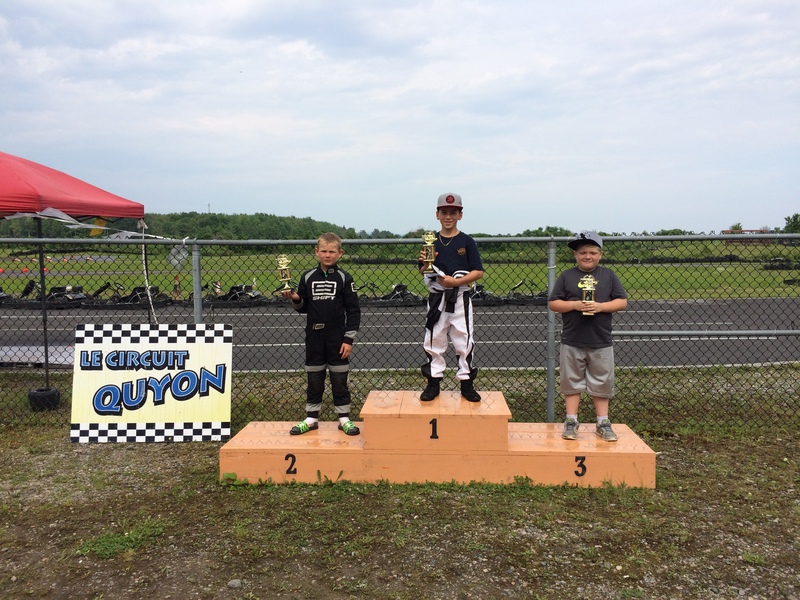 Connor’s brother Ethan, who was the 2015 OGKC Novice Champion, rounded out the top three in style – it was great to watch the close racing. Hopefully this rivalry will continue into the summer! Linkin Stevens and Samuel Spurling had a fun time in the challenging conditions. Once you can master racing in the rain, racing on a dry track becomes that much easier. The Novices ran on the track at the same time as the Juniors, and were demonstrating to the crowd that they can definitely stay close to the Juniors on a rainy day – great job Novices! Last year’s reigning champion, Charlotte Lalonde, won both Race #1 and #2, and had leads of over half a lap by the end of both events. She again demonstrated a mastery for the track, putting her Margay at the front of the field. The chasing pack was much closer together, with Paul Hoffman putting in fast lap after fast lap (and avoiding spins) to bring his Margay home in second in Race #1. Jason Chen, driving a CRG for this race, finished a strong third place. Charlotte Lalonde was once again victorious in the Senior category. Phil Stang had a strong and clean race to bring his kart home in a solid second position. This is Phil’s best finish so far in the Senior category, and in inclement conditions – well done Phil! Rounding out the top three is up-and-coming racer Paul Hoffman, finishing the day with a second and a third in the two Finals. It was great to see such a well-fought and entertaining event – great work Seniors! What a fantastic race for Barrovian Brian McCracken – this is Brian’s first victory in an OGKC race final and it was very well deserved indeed. 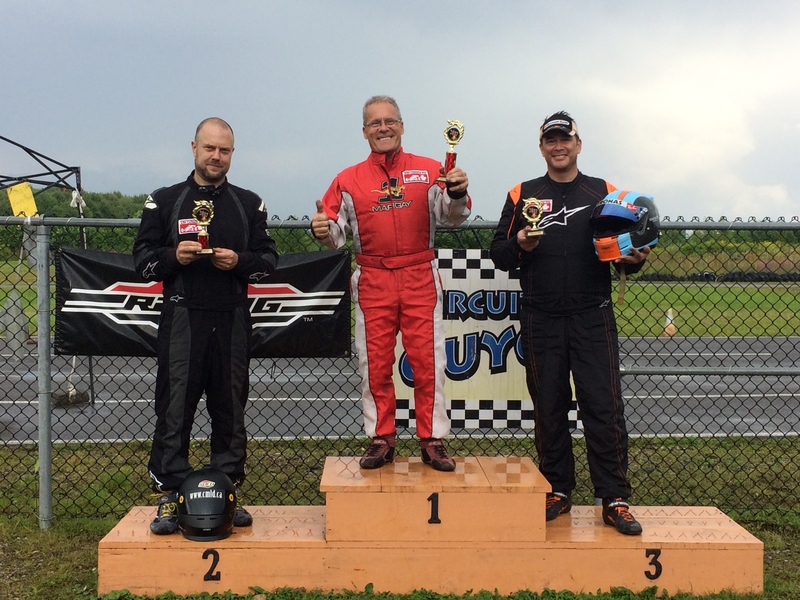 Brian showed up to the party late, almost missing the event, but managed to set up his CRG just in time to hit the track and take the win. He drove a smooth and calm race in the rain to eek out the win over Crawford Kilpatrick. 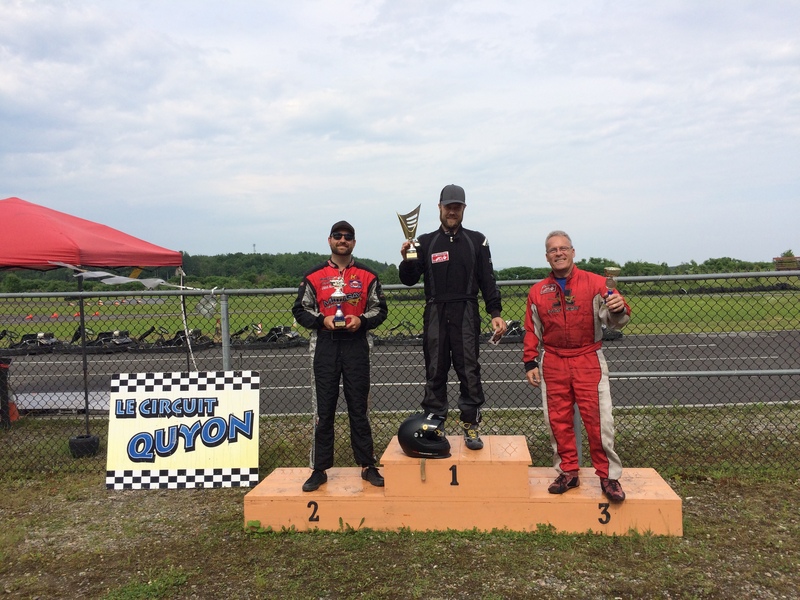 Track expert and 2016 OGKC Masters Champion Mike Forget, a regular on the podium at Le Circuit Quyon, placed a strong third after some contact in the pack. Mike Forget returned to the top step of the podium for Race #2, taking the win in style. Mike led for most of the race, and demonstrated his mighty racecraft in the wet conditions. On the final lap of the race, Crawford Kilpatrick managed to steal second place from Darren Mallette with a daring inside pass down the final hill before the finish line. Darren made a minor error around the hairpin, which resulted in a side-by-side drag race with Crawford down the hill. It was a very close race, with multiple spins and off track excursions – but no major damage and no injuries. Congratulations to all of the racers that made the podium, and a big thank you to everyone that participated in Races #1 and #2 of the 2017 OGKC Spring Sprint Series. Great job everyone! With only one race left in the three-race series, who will be the winners? The points for the series can be viewed here. Special thanks to Race Director Jason Bolton, the track marshals, the great support staff at Le Circuit Quyon, and First Aid personnel for working through the day in the rainy weather to ensure racer safety during the event. Round #3 of the OGKC’s Spring Sprint Series is scheduled for Sunday, May 28. It will also be Race #1 of the OGKC Rental-kart Challenge, weather permitting. Please click here for more information on the rental series.